To remedy this situation we are setting up the Fifth Estate Expansion Fund for the purpose of raising $500 to purchase outdoor newsstands with. This would give us a distribution across the city. If you believe in the Fifth Estate and what it stands for you can assist us in this effort by doing one of the things listed in the box below. 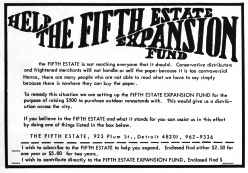 * I wish to subscribe to the Fifth Estate to help you expand. Enclosed find either $2.50 for one year or $5.00 for two years.